“It’s not because you don’t have the means that you don’t dream,” says Guy-Serge Namane, a director at the second Bushman Film Festival, a cornucopia of global smartphone cinema. “Action!,” his assistant director calls. Namane asks actress Berenice Irie, in full make-up, to knock on the door of Room 8 at the Bushman Cafe in Abidjan, the venue at the centre of the second such festival, unique in West Africa. Another assistant lights the scene with the lamp on his mobile phone. “With the telephone, we can communicate but we can also make films and we can even cast the light to make films!” Namane jests. The three-day festival, which ended Sunday and followed an inaugural event in 2017, received more than 5 000 entries, of which organisers said they retained 3,694 submissions that met the required format. The Bushman Cafe, a verdant venue with hotel and restaurant, provided several movie theatres. Entries were submitted from all over the world, of which 350 were selected and a shorter list established to compete for five prizes. The overarching aim of the festival, amply covered on social media, is to promote new talent. “This is a launch pad. We give a voice to those who have no voice. The goal is not simply to show films and stage an exhibition, but to accompany people in producing better films by way of sponsors and prizes. We help others to go into production or be shown on bigger platforms,” said festival organiser Princesse Nomo. 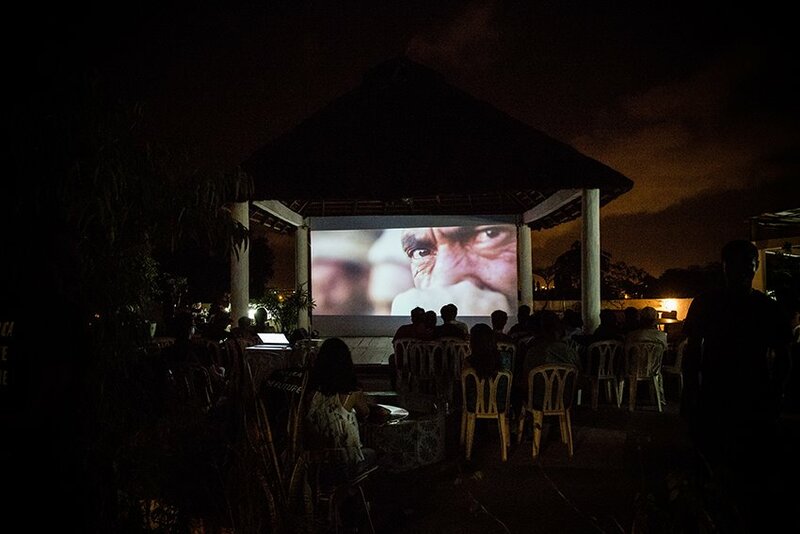 The event included workshops for students and master classes with professional directors and conferences, but the main purpose was simply to show films. One of the movies portrayed a crafty, streetwise hustler who used social media to boost the faltering career of a star, even as he divests her of her … smartphone. A change from the telly! People like Namane went right on filming. His actress Berenice Irie weeps over the broken body of her lover near the swimming pool. Just a few metres (yards) away an evangelical pastor dressed entirely in white with an enormous cross on his chest stared inquisitively at the art gallery on another set. “They slog away. They have ideas. We try to channel this energy a little,” said professional director Luis Marques, a member of the jury who also oversaw a project to make two films in 24 hours. “We really want to do this,” Irie said. “I hope that the film will be watched so that we can move beyond” the chronic lack of resources. Inside the cinemas, audiences laughed loudly and cried out when startled and surprised by the ingenuity of the smartphone film directors. “It’s funny. It makes a change from what we see on the telly,” said Nadia Gohou, who is studying to work in the hotel business. “Sometimes there’s a lot of background noise and the picture is not clear like it is on the telly, but that’s fine all the same,” she added. The post Smartphone moviemakers take the limelight at African festival appeared first on SABC News – Breaking news, special reports, world, business, sport coverage of all South African current events. Africa's news leader..